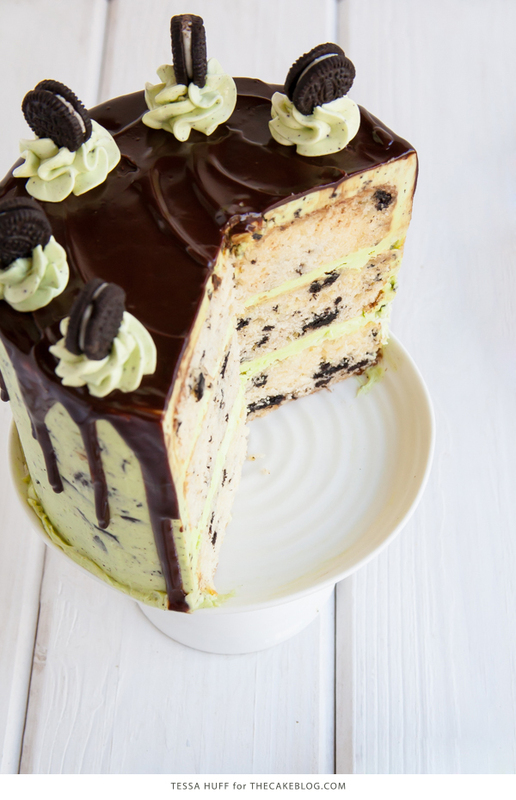 Mint Cookies and Cream Cake – mint buttercream sandwiched between cookie-studded cake, smothered with mint Oreo frosting, topped with drippy chocolate ganache. 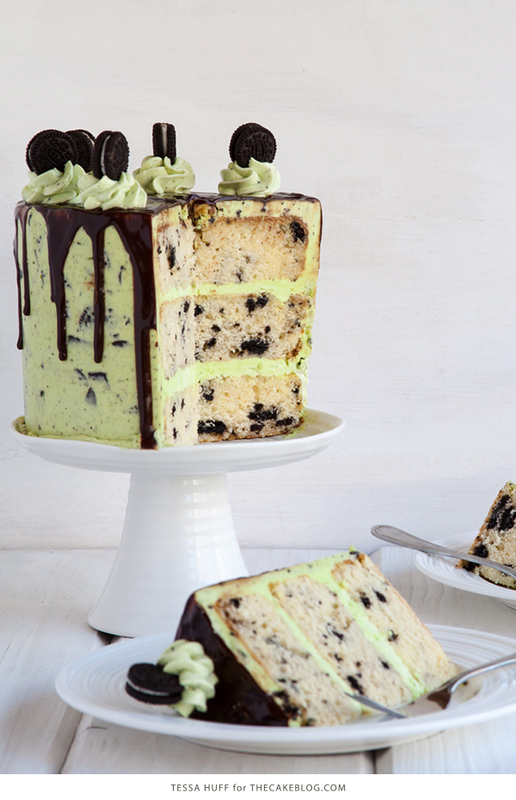 A new layer cake recipe by our contributor, Tessa Huff. This season has me craving two very different types of sweets – fresh, fruity ones that take advantage of the current produce overflowing at the farmer’s market (like last month’s Strawberry Thyme Cake, for example), and ones that are just plain fun. The streets filled with tourists and a sun that does not set until after 9pm are constant reminders that summer is in full swing over here. 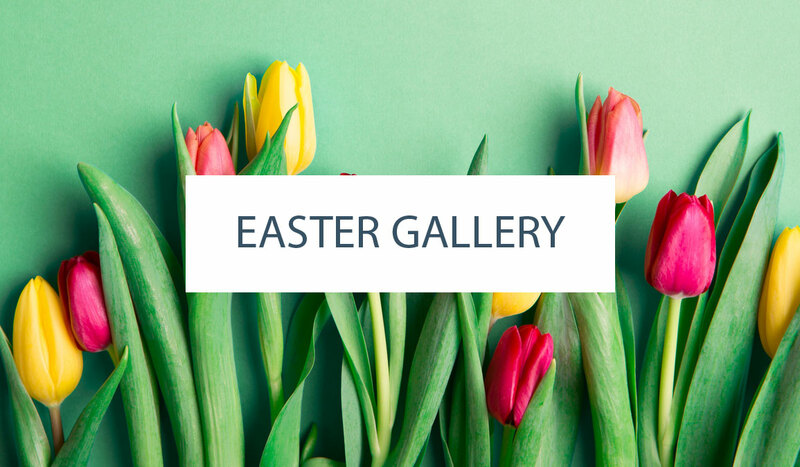 It’s a time to celebrate and let loose a bit! Whether you are hosting a summer birthday, heading to a backyard BBQ, or enjoying a picnic in the park, you’ll want your dessert to match whatever carefree or joyous occasion you have lined up next on the calendar. And while this Mint Cookies ’N Cream Cake might not be as relaxed and simple as say a cake with just berries and cream, this whimsical number is sure to brighten up any celebration. Cookies ’n Cream anything is pretty hard to resist. From ice cream to cheesecake, it is definitely one of my weaknesses. Not only do I look forward to the hidden bites of cookie chunks, there is just something so childlike and playful about a dessert laced with cookies. 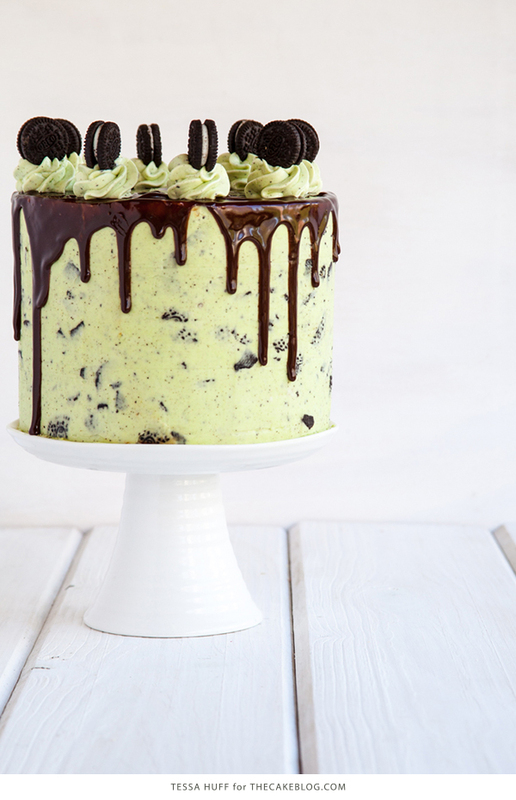 Nothing is more playful than a layer cake, so why not stuff one with cookies too?! 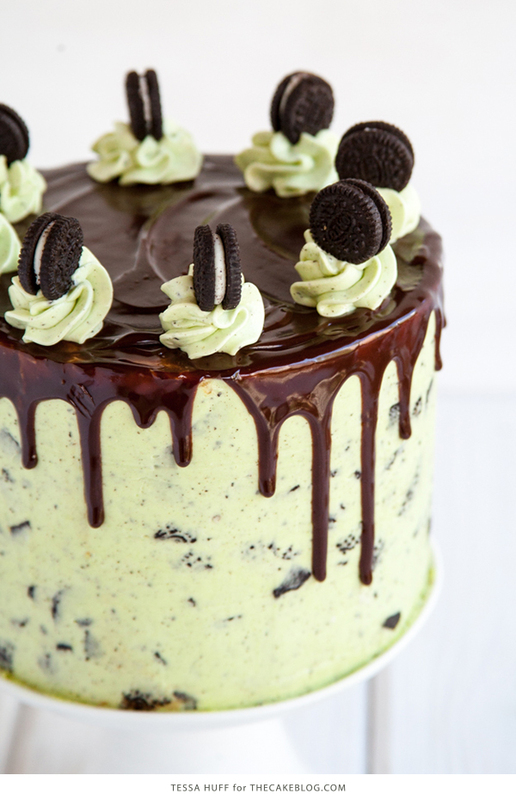 Add in a simple twist, like mint, and top it with gorgeous, drippy chocolate glaze, and you just can’t help but smile! When I first started to develop this recipe, I was thinking chocolate cake with vanilla filling – just like the sandwich cookie, until a light bulb went off in my head. Why not mix the actual cookies into the cake? And then into the frosting! Similar to the way sprinkles are incorporated to make “Funfetti” cake, the cookies ended up straight in the batter and buttercream. 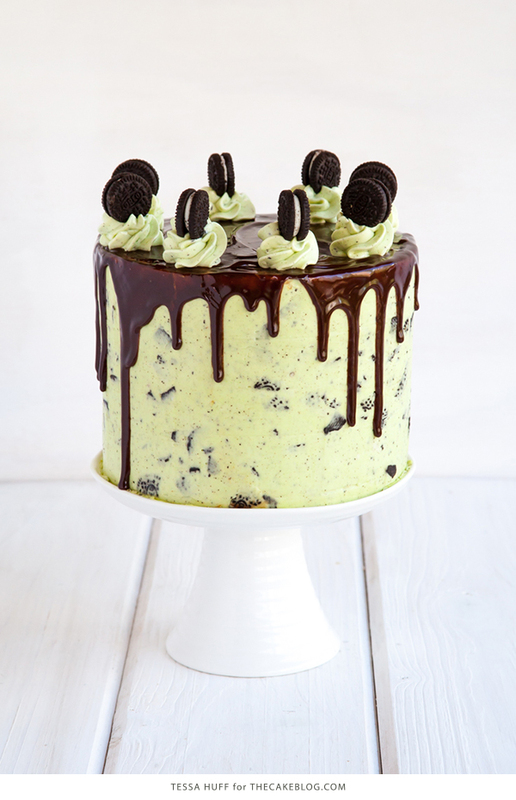 To turn the whole creation up a notch, I added mint into the mix and turned the frosting bright green. 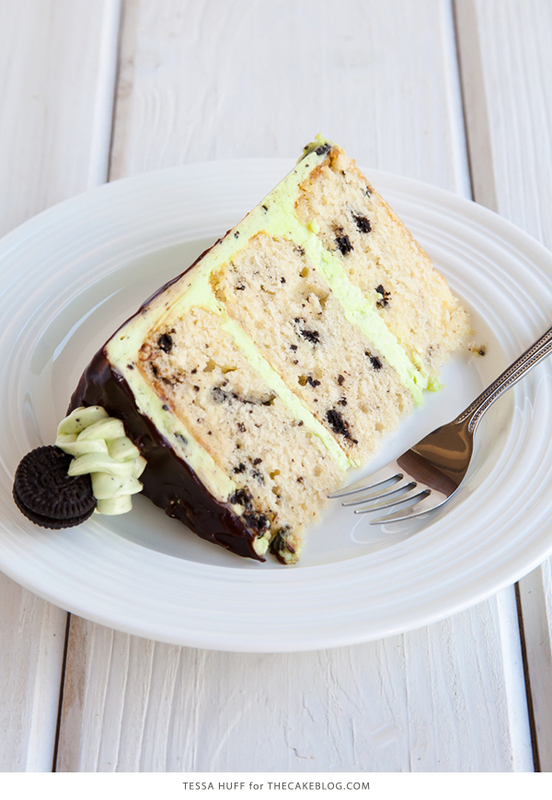 Layers of silky mint buttercream are sandwiched between crushed cookie-studded vanilla cake and smothered with a mint cookie frosting. To make the cake even more festive and “party ready,” it is glazed with chocolate sauce and decorated with frosting rosettes and mini cookies. 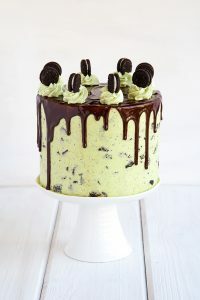 Mint Cookies and Cream Cake – mint buttercream sandwiched between cookie-studded cake, smothered with mint Oreo frosting, topped with drippy chocolate ganache. Turn the mixer down to medium-low and add in the vanilla, eggs, and egg yolk. Stop the mixer and scrape down the bowl. Working in three alternating batches, starting and ending with the dry ingredients, add the flour mixture and milk on low speed. Fold in the crushed chocolate cookies until combined. Evenly distribute the batter between the pans and bake for about 24 to 26 minutes, or until a toothpick inserted in the center of the cakes comes out clean. Cool on a wire rack for 10 to 15 minutes before removing the cakes from their pans. 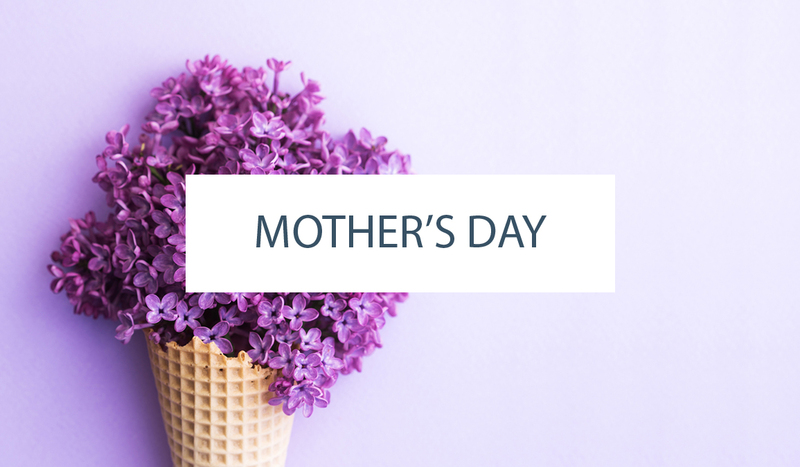 Place the egg whites and sugar in the bowl of an electric mixer. Stir to combine. Fill a medium saucepan with a few inches of water and place over medium heat. Put the mixer bowl on the top of the saucepan to create a double-boiler. While whisking, heat until the egg mixture reaches about 160 degrees on a candy thermometer. Once hot, carefully return the bowl back to the mixer fitted with the whisk attachment. Beat on high for about 7 to 10 minutes, or until the outside of the bowl returns to room temperature and the meringue holds medium peaks. Stop the mixer and swap out the whisk for paddle attachment. With the mixer on medium-low, add in the butter, and few tablespoons at a time. Mix until silky smooth. Add in the vanilla, mint and green gel food coloring, if desired. Mix until smooth. Once the cakes are cool, trim and level the tops so that they are flat. Place one cake layer on a cake board or serving dish. Spread on about 3/4 cup mint filling. Top with the next layer of cake and repeat. Crumb coat the cake with the mint filling, then refrigerate to set – about 10 minutes. Stir in 1 1/4 to 1 1/2 cups crushed chocolate sandwich cookies into the remaining mint filling. Frost the outside of the cake with the cookie-studded icing. Place the chocolate, cream, and corn syrup in a saucepan and heat over medium-high heat. Being careful not to scorch the cream, heat until the cream begins to steam and the chocolate starts to melt. Remove from the heat, whisk until smooth. Let cool. Once glaze is completely cool but still pourable, lightly drizzle over the top of the cake, letting it drip down the sides. Once the glaze sets, decorate the top with any remaining buttercream and mini chocolate sandwich cookies. Oh my goodness. I love anything with mint and cookies! I wouldn’t’ want to share this beauty with anyone. Such a gorgeous cake! same here! Mint and cookies anything is always delicious! Looks beautiful and delicious… is it ok to double the recipe for a bigger cake? any suggestions? Hi Claudia! Some recipes work just fine when you double them – but unfortunately – some do not. We have not tested this recipe as a double quantity so we cannot provide specifics on pan sizes and baking times. Absolutely gorgeous! I love how the oreos are mixed in everything. That melted chocolate is making me drool! 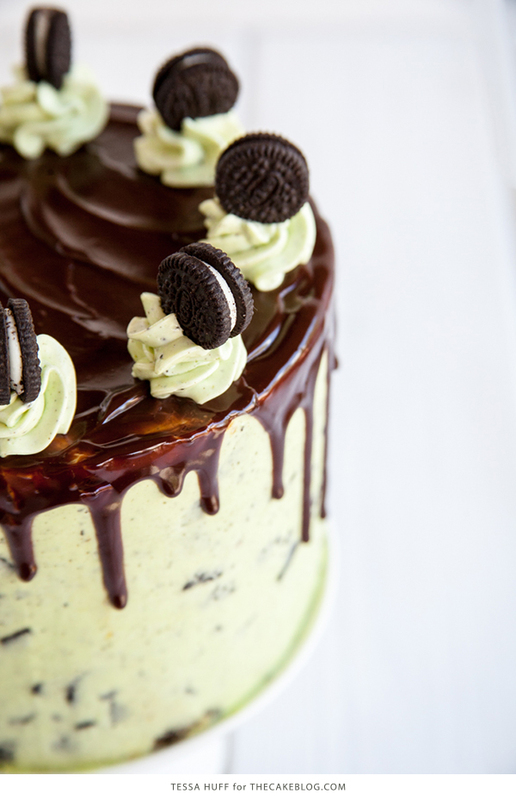 Just looking at these pictures makes me want to eat the cake off the screen, looks incredible! I am with everyone else on how delicious and stunning this cake looks. You are right, who doesn’t love cookies and cream anything. I made this recently and make a lot of cakes but found this to be a dense cake. It was delicious but wonder if the texture is supposed to be on the dense side? It looked and tasted wonderful but thought it would be a lighter crumb. When I was looking at the pictures, I honestly thought it was an ice cream cake. You did an excellent job! I made this recipe and it came out excellently. My only problem was accidentally adding too many cookies to the icing so that it came out a little more like grout than that beautiful green texture! A lesson for next time.